When it comes to length, few waterslides can compete with our Caustic Drop Water Slide, a massive inflatable that spans over 22' in length! The Caustic Drop Water Slide features an exciting industrial theme and sports a yellow-green-black color scheme that stands out, and the waterslide funnels guests into an inflatable pool with a loud splash! 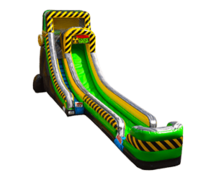 A summer favorite, our Caustic Drop Water Slide is sure to inject excitement and thrills to any type of party, celebration, or school/church/corporate event.